The Lee monument stands in Emancipation Park (formerly Lee Park) where Alderman praised Lee’s “great stock” on May 21, 1924. White nationalists rallied to defend the statue on August 11 and 12, 2018. Photo by Frederick Coye Heard. An evolving community memorial to Heather Heyer on the street where she was murdered by a white nationalist on August 12, 2017. Photo by Frederick Coye Heard. Virginians have largely forgotten the monument’s dedication, but there is a clear thread connecting Alderman’s speech to our present battles over collective identities and the history of racial oppression. One year ago, on August 11 and 12, 2017, white nationalists from around the country gathered to protest the planned removal of the Lee monument. Following the alt-right’s violent occupation of Charlottesville’s streets and the murder of Heather Heyer, moderate Virginians have insisted that the Neo-Nazis, Klansmen, and other extremist groups do not represent who ‘we’ are. 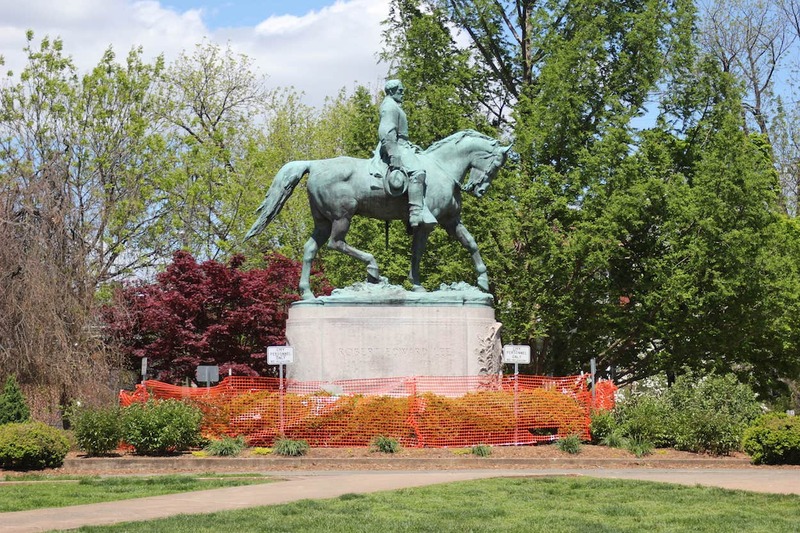 But, in their fight for the monument, the white nationalists displayed a better understanding of the statue’s significance, and of the legacy of state-sponsored, pseudo-scientific apartheid that most Virginians prefer to ignore. In fact, just two months before Alderman praised Lee’s Anglo-Saxon “stock,” Virginia signed into law the Racial Integrity Act and the Eugenical Sterilization Act, two laws that used an ‘objective’ scientific veneer to officially consolidate Virginia’s white-supremacist body politic. Those laws remained on the books far longer than most Virginians realize, sanctioning a racist program of forced sterilization and shaping the political identity of Virginia for generations. It was that repressed history – a history that white nationalists know and embrace – that resurfaced as Charlottesville’s Unite the Right race riot in the summer of 2017. Those laws remained on the books far longer than most Virginians realize, sanctioning a racist program of forced sterilization and shaping the political identity of Virginia for generations. It was that repressed history that resurfaced as Charlottesville’s Unite the Right race riot in the summer of 2017. On March 20, 1924, just two months before he attended the unveiling ceremony in Charlottesville, Virginia’s governor E. Lee Trinkle signed two laws intended to protect the Commonwealth’s “great stock” from genetic deterioration. The first of those laws, the Racial Integrity Act, was the most restrictive anti-miscegenation statute in the country. The second law, the Eugenical Sterilization Act, attempted to purify the white race internally by sterilizing “unfit” individuals. Together, these laws aimed at preserving a “superior race.” They would have radical impacts on racial policies in Virginia and the wider United States, and would lead to two landmark decisions by the Supreme Court. The Racial Integrity Act of 1924 was the brainchild of three Richmond eugenicists: Earnest Sevier Cox, John Powell, and Walter A. Plecker. Together, these three men – an amateur anthropologist, an ethnomusicologist and an ambitious bureaucrat – won broad acceptance for the idea that modern science supported the state’s long-held belief in white superiority. With the influence of Cox, Plecker and Powell co-wrote the Racial Integrity Act, expanding the criminalization of interracial marriage in Virginia. The act also reinforced the so-called one drop rule by legally defining “white” as having “no trace whatsoever of any blood other than Caucasian.” While a “Pocahontas exemption” was included to accommodate the genealogical myths of Richmond gentility, Plecker effectively invalidated “Indian” as a category for state records by requiring official documents to register Virginians as either “white” or “colored.” Basing their work on previous centuries of white supremacist intellectual and political activity in the United States, Cox, Powell, and Plecker cultivated a pseudo-scientific urgency that turned criminal laws and social norms even more stridently towards the protection of white supremacy and white “purity.” In this project, they were far from alone. Although Virginia passed the most extreme anti-miscegenation laws in the country, the state’s obsession with preserving the whiteness of the body polity politic was not limited to keeping people of color from “contaminating” bloodlines. The state also attempted to breed out “imperfections” within white bloodlines under the auspices of improving public health. As Charlottesville’s Lee monument was being unveiled in the spring of 1924, Joseph DeJarnette was working at Staunton’s Western State Hospital, just thirty-eight miles away, to protect Virginia’s Anglo-Saxon stock from internal degradation. Though DeJarnette was a doctor and hospital superintendent, he did not view his patients’ health as his chief professional responsibility. Instead, he believed his duty was to cure the genetic defects of the body politic. To that aim, he had long advocated sterilizing people deemed mentally deficient by the medical community. As early as 1915, DeJarnette argued that insanity – an expansive category that included perceived low intelligence and sexual promiscuity – is a hereditary threat to white genetic superiority that can and should be eradicated for the good of the nation. Citing a prominent eugenicist case study of an “unfit” eighteenth-century woman, DeJarnette urged colleagues at a medical conference to “think of the misery, distress, crime and damage done to society by allowing this weak-minded girl to reproduce.” He argued that it was the duty of doctors to cull the weak for the good of the herd. This advocacy of social engineering came to fruition in the Eugenical Sterilization Act, signed on the same day as the Racial Integrity Act. Six years later, DeJarnette was proud to report that the state had forcibly sterilized roughly 100 people per year between 1924 and 1930, and he hoped to see that number grow to 500 per year in the near future. In fact, the Commonwealth would eventually sterilize an estimated 8,000 Virginians under the auspices of the Eugenical Sterilization Act. DeJarnette’s Western State Hospital alone forcibly sterilized more than 1,400 people. The Virginia Colony for Epileptics and the Feebleminded, which DeJarnette helped found, sterilized approximately 4,000 Virginians. Among those sterilized at the Lynchburg Colony was Carrie Buck, the young woman whose 1927 tubal ligation led to a Supreme Court ruling that legalized sterilization “for the protection and health of the state” nationwide. The ruling in Buck v. Bell has never been overturned, and it remains legal precedent in 2018. While compulsory sterilizations continued late into the 20thth century, they had become a deeply repressed policy by 1980, when a new superintendent at the Lynchburg Training School (previously the Colony for Epileptics and the Feebleminded), told reporters at the Winchester Evening Star about the extent of Virginia’s eugenics programs. The revelation became national news and triggered Poe v. Lynchburg, a lawsuit seeking compensation for the state’s victims. Rather than taking responsibility for the damage done to Virginians by the attempted engineering of white breeding stock, the Commonwealth fought the suit for five years before agreeing to run ads over a three-week period, alerting potential victims that state hospitals had performed compulsory sterilizations for over half a century. Victims would not be offered compensation for another thirty years. The following year, on the 75th anniversary of Buck v. Bell, Governor Mark Warner echoed the assembly’s proclamation, saying that “we must remember the Commonwealth’s mistakes in order to prevent them from reoccurring.” If official apologies are to be believed, Virginia’s eugenics programs emerged from nowhere and vanished just as cleanly. While they espouse faith in an enlightened citizenry and the protective power of memory, these apologies remove eugenics from all historical contexts, begging the question of what the state and its citizens will be forgetting if they remember eugenics in this abstract way. The renewed boldness of white supremacist movements, on display at the 2017 Unite the Right rally, demonstrate that this kind of decontextualized semi-remembering has high stakes. A state historical marker in Charlottesville commemorating the Supreme Court's Buck v. Bell decision. Carrie Buck was born in Charlottesville and is buried half a mile from where Heather Heyer was murdered. Photo by Frederick Coye Heard. Remembering past injustices in detail is uncomfortable and inconvenient, especially when those injustices complicate the political and economic narratives of our present moment. The piecemeal remembering endorsed by the state’s legislative and executive branches is only one way that apparent efforts to remember history can obscure important parts of the past. The more common way of forgetting the unpleasant past is more straightforward: we ignore it, tiptoe around it, and end up defending it. The public memory of DeJarnette’s Western State Hospital provides a textbook example. While the hospital grounds have been listed on the National Register of Historic Places since 1969, the registry whitewashes the legacy of the hospital and hides its role in Virginia’s eugenics program. In an ironic anticipation of the Joint Assembly’s call for an “enlightened” populace, the state’s applications for NRHP status describe Western State as “a testament to the tradition of enlightened care of the mentally ill in Virginia.” The applications fail to mention DeJarnette, Western State Hospital’s longest serving superintendent, or the 1,400 compulsory sterilizations performed on site. However, the applications do take every opportunity to link the hospital to Thomas Jefferson, the state’s most prominent Enlightenment figure, even though he died two years before the hospital’s founding and had no direct connection to it. The current owners of the Western State campus – a Richmond real-estate firm renovating the hospital into luxury condos, loft-style apartments, and a boutique hotel – follow the state’s lead in treating Western State as an image of Jefferson’s enlightened Virginia. In promotional material and documentation they filed with the NRHP between 2006 and 2009, the owners describe “Federal Greek Revival structures, built by the same masons who constructed the University of Virginia.” The newly operational hotel is even named for one of those masons. DeJarnette is briefly mentioned in the NRHP documents, but they describe him as an amateur architect (he designed several later buildings) rather than a chief architect of the Commonwealth’s eugenics program. They praise DeJarnette’s scheme to save state money by having patients make bricks for new buildings as a kind of occupational therapy, but his other innovations, like forcibly sterilizing women to save the white race, are ignored entirely. The historical significance of Western State as a center of Virginia’s eugenics program is as thoroughly buried as the approximately 2,000 patients who lie under blank headstones behind the hospital. Although the state has apologized for its eugenics program and enjoined Virginians not to forget our past, it is a far more difficult thing to remember the specific sites where lives were destroyed in the name of genetic white supremacy. When those sites are the familiar landmarks of our neighborhoods, universities, and places of businesses, it is all too easy to dodge any real examination of the past by promoting a superficial form of abstract memory. A cemetery of approximately 2,000 graves sits behind Western State Hospital. The headstones mark the graves of Western State patients, and most do not carry any names or identifying marks. Photo by Frederick Coye Heard. Although the state has apologized for its eugenics program and enjoined Virginians not to forget our past, it is a far more difficult thing to remember the specific sites where lives were destroyed in the name of genetic white supremacy. When those sites are the familiar landmarks of our neighborhoods, universities, and places of businesses, it is all too easy to dodge any real examination of the past. It is ironic that attempts to whitewash Western State’s history as a site of forced sterilization lean so hard on tenuous connections to Thomas Jefferson and the University of Virginia. Certainly, the image of Virginia enlightenment represented by Jefferson and the school (known locally as “Mr. Jefferson’s university”) present a more appealing history than DeJarnette’s white-nationalist social engineering. But, as we too easily forget, Jefferson and the University of Virginia were also advocates of white-nationalist social engineering. It is often noted that Jefferson was a bundle of contradictions. He was a political revolutionary who also enslaved his fellow human beings. He was the author of the Declaration of Independence who also wrote Notes on the State of Virginia, a treatise whose extended discourse on race laid the groundwork for Virginia’s easy acceptance of eugenics. In point after point that anticipates the arguments of twentieth-century eugenicists like Cox and DeJarnette, Jefferson claimed that Black Virginians were “a distinct race” that is “inferior to the whites” in natural beauty, forethought, reflection, and control of sexual appetites. Claiming that Black people lacked the mental capacities for science and art – in other words, for civilization – Jefferson advocated removing freed Black people “beyond the reach of mixture” with their white neighbors. Like the later architects of Virginia’s eugenics program, Jefferson wanted to prevent Black people from contaminating Virginia’s white stock with their alleged inferiority. Mr. Jefferson’s university would, like its founder, prepare the Commonwealth to embrace the programs that Plecker and DeJarnette eagerly pursued in Richmond and Staunton. Before and after the Racial Integrity and Eugenical Sterilization Acts of 1924, Alderman’s UVA provided intellectual support and academic respectability for segregation and eugenics. Alderman hired men like the first dean of UVA’s School of Medicine, who warned society to protect itself from “the propagation of degenerate stock.” Another Alderman hire addressed the UVA branch of Cox’s and Powell’s Anglo-Saxon Club one month before the dedication of Charlottesville’s Lee monument, proclaiming that “the purity of the white race in America” was absolutely necessary for preserving “the heritage we have received.” As Gregory Michael Dorr details in Segregation’s Science, the eugenic theory coming out of UVA successfully bridged a potential gap between scientific modernity and cultural traditions in Virginia. In particular, UVA played a crucial role in dressing racial apartheid in theoretical language that made it palatable to modern thinkers in and beyond the Jim Crow South. Western State Hospital's old Main Building in the final phases of renovation. As the architecture indicates, this is one of the early 19th-century structures built by masons and other craftsmen who worked on Jefferson's UVA. It currently houses a boutique hotel with an attached bistro and wine bar. Photo by Frederick Coye Heard. The eugenic theory coming out of UVA successfully bridged a potential gap between scientific modernity and cultural traditions in Virginia. In particular, UVA played a crucial role in dressing racial apartheid in theoretical language that made it palatable to modern thinkers in and beyond the Jim Crow South. And so, it is no coincidence that the white nationalists of the alt-right chose this statue, at this park, in this university town, as the site of their 2017 race rally. It only appears as coincidence if we actively ignore the history, embedded in this very landscape, of Virginia’s political and ‘scientific’ attempts to preserve white racial purity. Not everyone who wants the Lee monument to remain in Emancipation Park is a conscious white nationalist. Many well-meaning Virginians argue that the Civil War is an important part of our past, that Lee was a significant figure in that war, and that we shouldn’t forget the history of the Commonwealth. But this argument, like the erasure of eugenics from the history of DeJarnette’s Western State Hospital, forgets more than it remembers. The white nationalists who provoked a violent confrontation around Charlottesville’s monument to Lee’s “great stock” understand the significance of the statue better than those self-styled moderates. On August 11, 2017, the night before the deadly clash in downtown Charlottesville, torch-bearing white nationalists marched across the University of Virginia and rallied around a statue of Thomas Jefferson. As they marched, they chanted “Blood and Soil” and “You will not replace us; Jews will not replace us.” Like Alderman, Plecker, Cox, DeJarnette, and –yes – Jefferson and UVA., they were laying claim to a tradition of white Virginians attempting to create – or, in true Lost Cause form, to salvage – a master race. Their repulsive vision of a “pure,” white Virginia should remind us that the state’s eugenics program was not an outlier in our history, not a single moment of madness that we can avoid through abstract enlightenment. Likewise, Unite the Right and other recent irruptions of white nationalism are grounded in a tradition of white supremacy broader than the alt-right and older than the eugenics movement. The proto-eugenic beliefs of the author of the Declaration of Independence and founder of the University of Virginia indicate the extent to which our government institutions and civil society are deeply rooted in the pseudo-science of white racial superiority. Those of us who resist racism must embrace the uncomfortable task of addressing not only the racists on our streets, but also the very real history and traditions to which they lay claim. We can’t effectively argue that white nationalism has no place in our state while we embrace traditions and institutions whose white nationalism we disingenuously ignore. The Lost Cause myth of the Civil War and Virginia’s white-nationalist breeding programs were so closely connected that the two movements share the same monuments. Rather than debating whether or not we should remove Confederate monuments that celebrate the genetic superiority of the white race and a war fought to preserve its systems of oppression, we should acknowledge the more challenging truth that toppling those monuments is at best a first step in extricating our institutions, and our collective memory, from the eugenicist ideologies of their founders. Frederick Coye Heard lives in Virginia's Shenandoah Valley where he writes about culture, politics, food, and other things that make it possible to live with our neighbors. He left both Texas and academia, but he remains irascible and erudite. You can see what he is up to at HeardFC.com or follow him on Twitter @HeardFC.